Travis Barker announced on Instagram he’s broken his ankle. He said he’ll still be playing every show booked. Fat Mike will release You’re Welcome, the debut full-length album by his Cokie The Clown persona, on April 26th via Fat Wreck Chords. Today he’s debuted the lead single “Punk Rock Saved My Life” with Travis Barker on drums and pre-orders are now up. Halseyperformed at the iHeart Music Awards with Travis Barker on drums. Travis Barker talked with Front Row Live Entertainment and mentions that Blink-182 should have new music out before Warped Tour. There’s a song that we refer to as “Paris” that’s really awesome. It was actually a beat I made for Juice WRLD and before I ever got in the studio with him, I played it randomly, and Mark [Hoppus] said, “Oh what are you working on?” They were like, “Whoa, we really like this.” And it morphed into a Blink song. It’s probably our favorite right now. Yungblud and Halsey have teamed up for the new song “11 Minutes” featuring Travis Barker on drums. Travis Barker is on the latest episode of the Joe Rogan podcast. The Blink 182 drummer bought this extensively modified Eldorado from well-known lowrider builder John D’Agostino, who built it at his Celebrity Kustoms shop in Discovery Bay, California. The list of modifications are too long to go over completely, but it has shaved door handles, an intricate custom ‘fade’ paint job, a custom upholstered interior and much, much more. More photos of the Cadillac can be found on Sotheby’s website. Travis Barker has shared a performance of “Little Drummer Boy” on YouTube. We’re doing it all over. We’ve been to Nashville a few times, we’ve done a lot in L.A. We actually wrote with John Feldmann, too, for the demos. Travis Barker laid the temporary drums for some, and that was cool. We’ve known John Feldmann since ’87 — he was in Electric Love Hogs. So we’re writing with different people. We grabbed [producer] Nick Raskulinecz, and he’s very hands on and such a fan of music. It’s not a job or a gig to him. The lineup for Travis Barker’s Musink Festival has been announced. Some fan shot footage of Travis Barker performing the end of “Violence” blindfolded at Blink-182’s Vegas show earlier this week has been uploaded to Twitter. 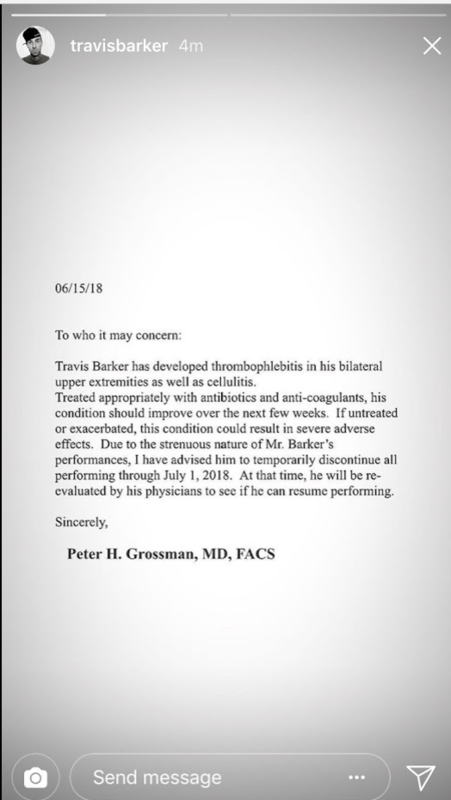 In the lawsuit — obtained by TMZ — Barker claims in June he went to The Medical Imaging Center in Santa Monica to receive an MRI as part of his routine checkup for his upcoming tour. Barker was to be sedated before the procedure, but technicians were unable to find a vein, sticking him at least 40x times in the process with a dirty needle and giving him staph. He’s suing the medical office. Law enforcement sources tell TMZ no children were on the bus and Travis was not at fault. After the crash Travis was walking around and did not appear seriously injured, although he did seem dazed. There were passengers in Travis’ car, including his son. We do not know their condition, but the collision was serious enough for Barker’s air bags to deploy. Travis Barker of Blink-182 has shared a video update on his recovery from blood clots. Travis Barker of Blink-182 has been re-hospitalized due to blood clots. Blink-182 have postponed two dates of their Las Vegas residency shows this weekend due to blood clots in Travis Barker’s arms. Modern Drummer have premiered a video of Travis Barker playing “Nowheresville” with Strung Out.